When I met with the newly trained Community Health Evangelism (CHE) trainers at Egichikeni, a congregation of the Church of Central Africa Presbyterian (CCAP) Synod of Zambia, the Rev. Mapopa Nyirongo shared with me the story of one of the neighboring villages whose beautiful pit latrines had lapsed into disarray because no one had maintained them.The government had built the pit latrines for the community and left. But the community assumed that the government would come back and provide the maintenance, just as it had provided the installation. This story, plus others like it, has been told over and over and is indicative of aid and development work across Africa. A website created by photojournalist Peter DiCampo even documents failed aid in Africa. The website is titled “Broken Toilets” (brokentoilets.org). Typically, aid from churches, nongovernmental organizations and governmental entities to people in countries across Africa focuses on what they think the people need. The aid offers solutions created and provided by these outside groups rather than addressing the needs identified by people in Africa using local resources. This dynamic puts the outside organizations in a position of power, strips people receiving aid of their dignity and overturns the local economy by pushing people deeper into poverty of mind and body. Used clothing and pillowcase dresses push out tailors and clothing factories and place reliance for clothing outside the country. The conviction that community ownership must be the foundation of any CHE initiative. As the Africa community health facilitator, I have the privilege and honor of accompanying our partner churches as they implement CHE as a foundational process in engaging the communities they serve. CHE uses a participatory-based method of training, engaging a community to find the answers themselves, in all aspects of its implementation. CHE also focuses on ongoing mentorship of individuals and communities and a deep-seated trust in the power of Christ to change hearts and minds. When CHE is first presented to a community, the community leaders (chiefs, district officers, church leaders) are led through a visioning process that presents the foundational concepts. CHE trainers then engage in a “seed project” within the community. This phase is concrete and tangible, providing the community with a glimpse of the possibilities of change and fostering connection and rapport. After a community has accepted CHE as a process in which they want to engage, the CHE trainers assist the community in selecting members of the group to form a committee whose role will be to guide and monitor implementation of the CHE project. In turn, the committee selects community health evangelists, who visit their neighbors, providing one-on-one education. The CHE trainers facilitate a process for communities to identify and prioritize their needs. They then identify local resources to meet those needs. Community projects are implemented to address the needs, and home visits providing relevant education are conducted in tandem. Any education provided, communally or in home visits, includes a physical element and a spiritual element, as an acknowledgment that both are of equal importance. The process seems straightforward enough until you encounter the deep-seated expectation that others will do for you. CHE is a paradigm shift. It’s a shift in seeing that those who have typically “received” have something to give and offer. It’s a shift in seeing the multitude of resources available locally, rather than only seeing resources that could come from outside the community. It’s a shift in understanding that individuals and communities can facilitate change within their own communities. Edison Kumwenda, CHE trainer for the Church of Central Africa Presbyterian (CCAP) Synod of Zambia, said change is challenging. “We people in the rural areas stick with what we know; we haven’t recognized our own resources. We have to convince ourselves to see the solution close to us. We always see the solutions outside ourselves,” he said. This shift — from receiving help to becoming change agents — is fundamental to the success of CHE and to the transformation of communities, because it speaks to our understanding of our worth in God’s eyes and to our call as Christians to be engaged in God’s work. When we believe that we have no resources and that we have to look to others for help, dignity and creativity can be buried. CHE reminds people of their intrinsic worth and power as people of God. This type of transformational change does not typically come quickly. Church partners and mission co-workers engaged in CHE know that this is slow work. It is the work of discipleship. Rachel Weller, mission co-worker in Ethiopia, tells the story of how complaints had begun circulating about her because she had not done a project or brought in money. “What is she doing? What has she brought for us?” people asked. “She’s waiting for us, ” said the Rev. Matthew Doleak, mission and evangelism director of the Ethiopian Evangelical Church Mekane Yesus, in the West Gambella Bethel Synod. Weller and Doleak understand that the success of initiatives such as CHE is directly related to the local communities’ own desire and thus to their own work carrying the process forward. The process takes patience. The Rev. 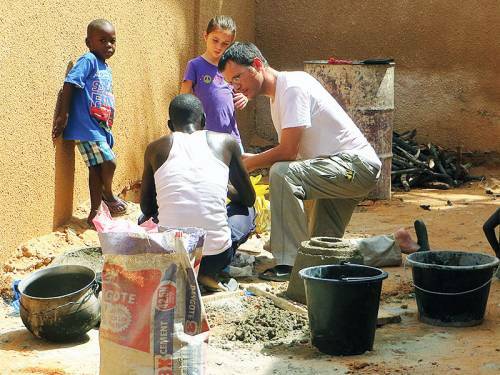 Michael Ludwig, mission co-worker with the Eglise Evangélique de la République du Niger (EERN) in Niger, learned from a CHE trainer that one group received three weeks of daily visits in which the same lesson focused on the difference between relief and development. Eventually the group grasped the lesson concepts and thus a key principle of CHE. Going slow can be a challenge for U.S. Christians, who are generally more time-bound and results-oriented. This willingness to go slow is part of creating lasting, sustainable change. While CHE is a slow process, change does come. 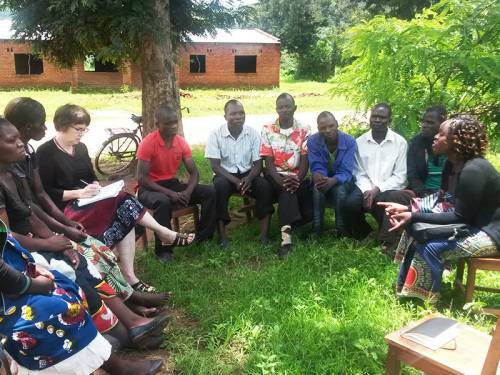 The CCAP Synod of Nkhoma in Malawi began implementing CHE in 2014. The eight villages in which CHE was first introduced identified hunger as the main issue facing their communities. With support of the CHE trainers, the communities worked together to identify the root causes of this hunger and to implement solutions. The communities determined that the problem was multifaceted: Maize yields were poor because the soil fertility was poor. Also, at the start of harvest season people sold their maize to get income and to buy ndiwo (the vegetables, meat and beans that are eaten with the local staple nsima). But by the time planting season arrived, the maize stores had run out and people were hungry, so they were out looking for odd jobs to be able to buy food — and then they didn’t have the time or energy to plant their fields. All of these factors contributed to each other, perpetuating the cycle of hunger. To address this complex issue of hunger the CHE communities approached each of the challenges. To improve soil fertility, they began making compost to apply to their fields. To address the food shortage, they planted three types of trees — nitrogen-fixing trees, fruit-bearing trees and trees good for wood fires. The CHE communities also planted kitchen gardens to grow food for their own ndiwo. Finally, they created a community silo. The silo was a spare room in a community member’s home. Each family’s bags of maize were accounted for, and the community decided together when people could collect their harvested maize. The CHE committee managed the silo. In 2016 6.5 million Malawians — nearly 40 percent of the population — were estimated to be food-insecure after a severe drought crippled maize crops across the country. The 2016 drought followed on the heels of a smaller hunger crisis that saw 3 million Malawians experiencing food insecurity, caused in part by heavy, sporadic rainfall insufficient to grow maize but strong enough to flood crops and damage homes. The World Food Program stated that the 2016 hunger response was “set to become the largest ever emergency food relief operation in the country’s history.” Yet even in the midst of the hunger crisis, the report we received from the CHE trainers in early 2017 was filled with encouragement. One community’s program had started with one silo and expanded to six, and plans were in the works to build a separate building for maize storage. Families who had applied compost and begun kitchen gardens not only did not go hungry but their maize yields were also higher than in years past. We heard several stories of families who initially weren’t interested in being a part of the CHE work but who decided to join the rest of the community when they began to see the literal and metaphorical fruit of the program. As a result of the CHE work, many individuals are professing a new faith in Christ, and Bible study groups are being formed for these new Christians. Change is coming to these communities through the new initiatives in which the communities have identified and implemented available resources. Kumwenda worked with the woman to help her to see that her chickens and goats were resources. The woman sold a chicken to buy vegetable seeds and is using the manure from her remaining chickens and goats to fertilize a garden. With the seeds and the manure, she has been able to grow vegetables that she sells in the local market. The connection to the biblical story of the woman and her oil is part of the foundation of understanding that a small amount can be a resource to create change. The PC(USA) church partners in Africa clearly see the value of integrating the spiritual and physical. They also have big dreams for how CHE can be a tool for shaping the ministry of the church. The CCAP Synod of Zambia and the EERN partners in Niger have both begun integrating CHE as a curriculum at their Bible schools. Their hope is that the pastors and evangelists they are training will have the skills and resources to engage the communities they serve in addressing not just spiritual needs but physical needs as well. Most of the CHE initiatives that I walk alongside are still in their infancy, but the joy and the hope that I see in those engaged with CHE are palpable. CHE trainers share with me stories of change in their own lives as they begin to see their own resources and implement new techniques. “I have found the importance of CHE especially at home. I have found change. With the kitchen garden now I don’t have the problem of finding food anymore, and now the money I used to use to buy food is available to send my children to school,” Stanwell Phiri, a CHE trainer in the CCAP Synod of Zambia. After learning to be a CHE trainer, Akwata Achow gathered together several of her neighbors to begin to improve their neighborhood. A few years later, when visiting that neighborhood, Weller saw the results. Beside most houses, Weller saw a crude dish rack holding plates, glasses and silverware that had been used for the last meal. Sitting in the sun, they were getting sterilized and staying out of the way of sheep, dogs and chickens. Each house had a place to store clean water to drink. And most houses had the remnants of a rainy season garden — pumpkins, okra and leaf cabbage plants. On my last visit to the CCAP Synod of Zambia, Benson Mkandawire, a CHE trainer, replied, “There is no challenge. CHE is a motivator.” The changes experienced in CHE communities have come from the education received, the thoughtful engagement of these communities and the accompaniment of the CHE trainers in facilitating these conversations and provision of education. Because these changes are a direct result of the community themselves, these changes will be long-lasting. These are the changes that will bring transformation we have been working toward for so many years. Luta Garbat-Welch is the Africa community health facilitator for PC(USA) World Mission.